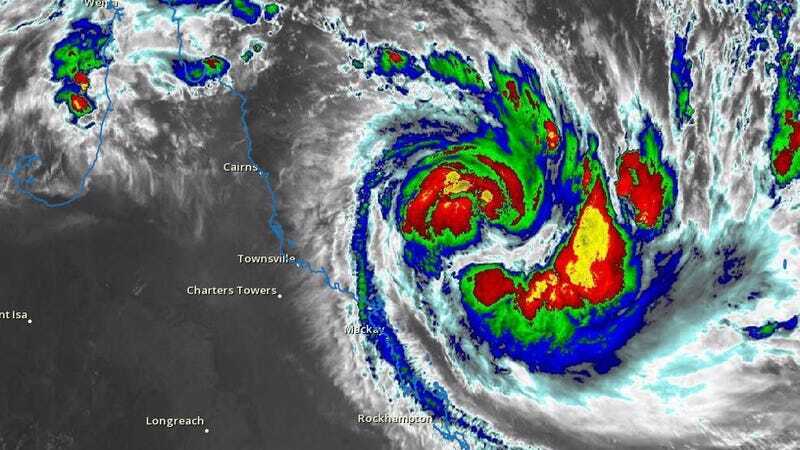 Around 25,000 people living in north Queensland are being asked to flee as a powerful cyclone is set to make landfall. Tropical storm Debbie is expected to hit the coastline tomorrow with 170 mile-per-hour gusts and storm surges as high as eight feet. Debbie was upgraded to a Category 4 storm earlier today, and it’s intensifying quickly. The cyclone will make landfall at 9:00 am local time on Tuesday, and it’s expected to bring extensive flooding to low-lying areas. Some 60 miles (100 km) of coastline is at risk, from Ayr, Bowen, and Hamilton Island to Airlie Beach, and Townsville. Debbie will be the most powerful storm to hit north Queensland since Category 5 Cyclone Yasi struck in February 2011. The Australian cyclone season runs from November 1 to April 30, and on average features about five tropical cyclones. The current season has been weaker than usual, with five named storms appearing thus far—Debbie being the most severe. Cyclone Debbie is expected to bring 75 mile-per-hour (120 km) winds and gusts reaching 170 miles-per-hour (275 km/h). Of particular concern are the storm surges, which could be as high as 8.2 feet (2.5 meters). The Mackay region of Queensland includes extensive low-lying areas, making it vulnerable to flooding. In response to the pending storm, the government has issued inundation maps, showing which regions are at risk. An estimated 25,000 residents live in areas threatened by flooding. The government has not issued a formal evacuation order, but it’s hoping Mackay residents will take action and seek higher ground before it’s too late. The government is currently setting up shelters for evacuees, and buses are transporting people from threatened towns. Over 100 schools have been shut down. Emergency service volunteers, police, and power employees have been dispatched to the region. The Prime Minister’s office is working closely with the Queensland government, and it’s sending in the Australian defence force to assist.